Bets get settled, debates are won or lost, and facts can be stubborn things. Science, on the other hand, helps us to better understand or to become enlightened by learning something new. Are we ever finished learning? Do we ever know everything? What about facts? SOTU provided a case study into the evolution of a sentence. In his address this past Tuesday night, the President stated the following. The debate is settled: climate change is a fact. Can you imagine the speechwriters’ interminable deliberations about how to handle this? Do you suppose an earlier draft declared that science is settled? Someone must have pointed out that science doesn’t get settled, so science morphed into debate. Apparently, in the minds of the speechwriters there are two sides to this debate. Is climate change a fact or perhaps not a fact? Is it true or false? Yes or no? Good or bad? Is there actually a debate about whether the climate changes? Can the President declare the end of a debate and that settles it? Executive power reaches new levels of authority. In truth, it is about the message, a political message. The President and his advisors assume that we will ignore the actual meaning of the sentence, but accept the underlying message and move on. What is the intended message anyway? Like all presidents, this one has an agenda that he wants to pursue. He’s impatient for the people and their congress to support his energy policies. He rationalizes and justifies his proposals by arguing that continuing the burning of carbon based fuels ultimately results in catastrophic consequences for the environment, particularly global warming. There is opposition to his agenda, as there often is when various interest groups have a stake in the outcome of a political debate. The opposition argues that the President’s proposed energy policies create serious economic hardships for everyone through higher costs for fuels, increased taxes, and regulatory burden. So why are we arguing over whether climate change is a fact? In truth, we are not. The statement uttered in the State of the Union Address is inane! It offers an empty and insubstantial notion lacking any significant meaning or logical point. Is anyone debating whether the climate changes? Anyone who knows anything about climate knows that the Earth’s climate is always changing, always has and always will. Anyone except those who believe the nonsensical proposition that the climate was perfect and unchanging until we began putting gasoline in our cars and heating our homes with wood, coal, oil, natural gas, and cow dung. Listen carefully to their statements and you will hear this underlying assumption. Ironically, the same folks who came up with the sentence declaring that climate change is a fact, also invented an equally trite cliché. They want to combat climate change? Does that mean we should adopt their policies and the climate will stop changing? Whatever you decide to do will have no impact on your climate, but will have a profound impact on your economy. . . . trying to solve a problem that may not be a problem by taking actions that you know will hurt your economy. And this makes no political sense. The debate about energy policy is not settled. Whether the climate changed in the past or how it might change in the future is irrelevant to the policy discussion. Allow me to offer some scientific evidence about climate change. 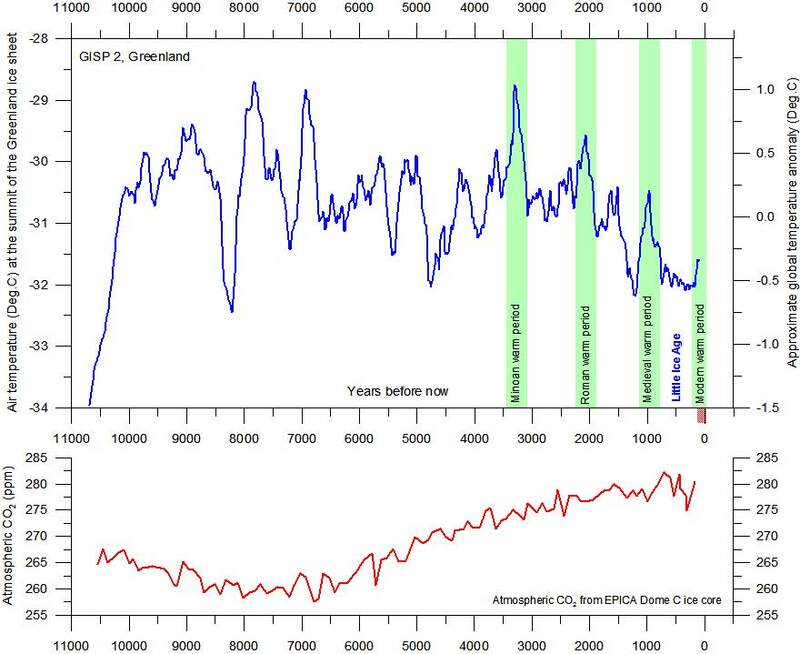 This first graphic image is of temperature (blue) and carbon dioxide concentrations (red) during the current interglacial which commenced about 12 to 18 thousand years ago. The data came from a Greenland ice core. You should note two important points about these temperature trends: 1) temperature changes over time; and 2) the current warming observed since the middle of the seventeen century follows one of the coldest periods since the end of the most recent glaciation. With regard to amount of carbon dioxide in the atmosphere, at this location it has been increasing rather steadily for about 8000 years. The second graphic below depicts global temperature trends over the entire earth over the past 35 years. Scientists at The University of Alabama at Huntsville analyze the data from NASA satellites. Their analysis describes temperatures in the lower troposphere over the entire earth surface. This represents the global temperature record since the first satellites were placed into orbit for this purpose only in the late 1970s. There are five temperature trends showing the south polar, southern, equatorial, northern, and north polar regions. Again, you should notice that temperature does change with time and with the seasons particularly in the polar regions. Over this time period, it has been warming in the Arctic, cooling in the Antarctic, but not so much of either in the other regions. This last graphic image below is the monthly global average temperature from analysis by the scientists at the University of Alabama at Huntsville. This derives from the same satellites data as the chart above but averages all five regions. You should note that seasonal variation is minimal because it is winter in the northern hemisphere when it is summer in the southern hemisphere and likewise for spring and fall. Average global temperature changes from month to month and year to year. Ever since the El Nino of the late 1990s, the global average temperature has been generally higher than before that rather influential weather phenomenon, but importantly, there has been a hiatus in the general trend of rising temperature for about 15 years. So the climate changes and that debate is finally settled. The sun rises in the east and that debate is settled as well. Morning follows night and that debate is over too. Nice to have all of this established. Now perhaps we can get on with the public policy issues before us. Should we make energy more expensive for everyone, hurting the poor disproportionately more than the affluent? Should we do this based upon a completely false notion that somehow we will stop the climate from changing or prevent the planet from warming? Should we support an energy policy that will ruin our economy and have no measurable impact on climate change? This entry was posted in Climate Science, Politics and tagged carbon dioxide, Climate Change, global warming, President, SOTU. Bookmark the permalink. Thanks, Doug. Still learning the writing craft. I do have quite a few Facebook, Twitter, and LinkedIn followers, although the number who actually read these musings is rather small. Excellent column. All any of us want is clarity, not bickering based on philosophy. Tired of never being able to believe either sides data or conclusions.